Are you ready to move-in with Metro, but not sure how to get all of your belongings to your storage unit? Whether you are rolling up your sleeves for a DIY move or need to rent a storage unit during a life transition, we can help. With years of storage experience at the locations we serve, our professionally trained Property Managers look forward to helping you with your moving and storage needs. With local moving truck rentals, you can rent your storage unit, pick up your moving boxes, and your truck at your nearest Metro Self Storage location. Whether you need a truck for a local move or self-delivery, a cross country moving truck rental, or the cheapest moving truck rental available, our friendly storage team is here to help. HOW MUCH IS A MOVING TRUCK RENTAL? Moving is stressful, and we all know there is no way around it, but there is a way to reduce the demands on your time when you rent a moving truck with Metro. We are the perfect partner for moving and storage. We offer clean and well-maintained storage units with top-notch security features in addition to packing supplies—all in one convenient location. When you need to rent a moving truck, remember that specifications vary between manufacturers. Penske and U-Haul may add new vehicles to their fleets at any time. Moving truck specifications will also vary between make, model, and year of truck. Nevertheless, below are some basic truck specifications to help you get an idea of how much moving truck rentals cost and the size truck you need. Whether you are planning a DIY move for your home or a local business, you can count on Metro to be here for you. A 10’ truck comfortably moves a studio apartment or the contents from one or two rooms in a house. This is also the most popular truck for students to rent when moving out of their dorms before summer break. While U-Haul offers 10’ moving trucks, the smallest Penske moving truck is 12’ and also specifies one to two-room moving projects. The 10’ and 12’ moving trucks offer one of the cheapest moving truck rental options, but we are always happy to help you figure out ways to save on truck rental costs at our Metro Self Storage moving truck locations. While Penske offers a 16′ moving truck and then jumps up to a 22’ truck size, U-Haul offers 15’ and 17’ trucks that may give you more financial options when choosing the right size truck for your move. Trucks within this size range can easily move two or three rooms. The load capacity varies between U-Haul and Penske moving trucks of the same or similar size, so be sure you understand the specifications on the truck you rent beforehand. 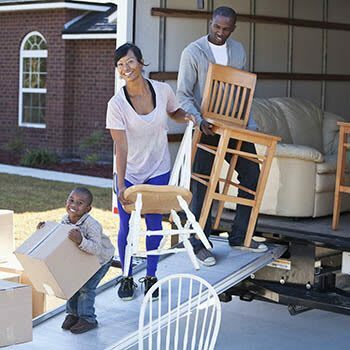 Determining how much your moving truck rental is going to cost will depend on the size truck you rent and when you plan to move. A 17’ moving truck is suitable for large apartment moves, two- and three-bedroom homes, and office relocation moves. U-Haul gives you more sizes to choose from, and you may be able to save money by renting a smaller 15’ or by choosing a Penske 16’ truck. Most 17’ trucks also include a loading ramp to make loading and unloading easier. All moving trucks come with added safety features such as high-visibility mirrors and seat belts. Penske’s 22′ truck offers enough storage space inside the truck to move most two to three bedroom homes as well as a small business. This size is also suitable for cross country moving truck rental. While moving truck features vary between U-Haul moving truck rentals and Penske moving trucks, you can count on 24/7 roadside assistance with any truck you rent. Once you determine the right truck size, figuring out how much your moving truck rental will cost will be a breeze when you choose to rent your truck at Metro Self Storage. A 26’ moving truck is the largest truck a DIY mover can drive in the United States without a commercial driver’s license. If you are looking for a cross country moving truck rental, the 26’ truck is a good option. Especially, if you are moving a three- or four-bedroom home and two- or three-car garage. The 26’ U-Haul truck boasts gentle-ride suspension, and the largest Penske moving truck promotes their anti-lock brakes. How much a moving truck across the country will cost you depends on the time of year you plan to travel. Remember, May through September is the height of moving season! We recommend reserving your moving truck well in advance during these months. We also recommend to use a dolly or hand truck and to lift heavier items with your legs when loading and unloading your truck rental. More tips on how to pack a moving truck can be found on our blog. Did you know that Metro Self Storage has conveniently located mini storage facilities in some of Penske’s “Top 10 Moving Destinations?” Penske compiles the most popular places people are moving to list from moving truck rental data. More people are moving to Chicago, Illinois, Tampa/Sarasota, Florida, and Atlanta, Georgia for work or retirement. We offer a wide selection of moving truck sizes at our truck rental locations. While small and mid-size trucks are ideal for local moves, larger trucks are often required for four- and five-bedroom households and businesses, whether moving across town or across the country. Keep in mind, moving trucks are in high demand from May through September—America’s busiest moving season! More comfort and convenience features are included with the largest U-Haul and Penske moving trucks. Larger moving truck rentals include air conditioning, cruise control, power steering, and diesel fuel for bigger savings at the pump. Larger trucks are not only designed to handle bigger households and businesses, but they can also tow a trailer. A cross country moving truck rental is a one-way rental. Whether you are planning a DIY move or to relocate your business, when you need a vehicle to transport the items that matter most in life, think of Metro as your one-stop shop. Whether you need to rent a moving truck, a storage unit, or both, your project will become less stressful when you choose your local Metro Self Storage.